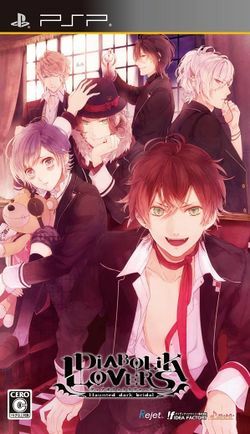 Diabolik Lovers ~Haunted Dark Bridal~, more commonly referred to simply as Diabolik Lovers, is a Japanese adventure game developed by Rejet for the PlayStation Portable, released on October 11, 2012 as the first in the Diabolik Lovers series. It is notable for becoming Rejet's breakout hit, gaining popularity which rivaled similar and long-standing series such as Hakuoki and Amnesia despite its controversial content. The plot centers on Yui Komori, an innocently average and religious high school student who is sent by her father to live in a mysterious and uninviting mansion. It is only upon arriving that she learns who she must share a home with: six sadistic vampires who claim her as their food. Its distinctiveness stems from its exploration of sadomasochistic relationships, which is unarguably the focus of the game's many routes. This page was last edited on 3 July 2014, at 09:40.